Great idea, well executed - open up a whole new side to your guitar playing. Smart design. Everything works. Sounds great. Yellow and black options only? Let's have a ridiculous sparkly one too! Hawaiian, blues, Western swing, country, rock and pop - the lap steel guitar crops up frequently in all kinds of music. Tuned to an open chord, most guitar players can slide out a lick or two on these simple beauties, such is their close relation to a regular six-string. Duesenberg's Pomona 6 begins with a slab mahogany body/neck, themed with the company's trademark three-stepped, Art Deco shaping. The square neck and 12mm action mean it can only be played Hawaiian style, across your lap, where you'll be ably guided by the metal fingerboard's fret-markers. Running right down the middle is a groove along which slides the Pomona 6's in-built capo: simply unscrew it using the thumbwheel and slide it up the neck - it's blissfully easy to use, enabling you to shift fuss-free to different keys. 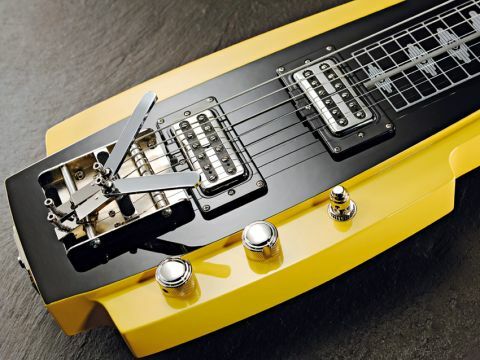 Pickups are a pair of Duesenberg Little Toaster humbuckers; so called because of their visual nod to Rickenbacker's 1950s 'toaster top' pickups. It's an Alnico magnet design, relatively low output and with a physically smaller housing than a PAF-style humbucker which, all other things being equal, usually means a slightly brighter response. They are controlled by a chunky three-way toggle selector. The short-travel tone control is a thoughtful addition in that it rotates around a quarter as much as a 'normal' pot - 70 degrees, in fact - while offering the full range of adjustment, meaning you can do wah-style effects with minimal effort. No such luxury on the volume pot, however, and quick, pedal steel-style volume swells are best handled and achieved by an external pedal. "There's enough twang to sound Nashville-esque and enough warmth to do mean blues." The real fun and games happen at the Duesenberg Multibender bridge, however. Available for some time as a retrofit from DB mainmain Dieter Goelsdorf's Göldo Music company, it finds its perfect home here. Every string excluding the low E can be fitted with an adjustable palm-bending lever; a simple mechanical device that enables you to raise or lower the pitch of strings: two come as standard and it makes sense to us to have them fitted to the G and B strings. The string is threaded over the bridge and into the lever, which is adjustable for travel and therefore pitch. Two semitones are within easy reach and, thanks to the simple screw adjusters, it's no problem to tweak them on the fly if things go a little awry. It's all very well engineered: exactly as it should be. Whether it's singing clean with the reverb of angels, or growling with Beelzebub's fuzz, there's nothing quite like the sound of sliding steel. The second the Pomona 6 came out of the case, it was surrounded by a bunch of cooing, grinning journos as it pushed a Smokey fag packet amp to meltdown. Tuned to open E, D or G, bluesy licks are second nature under heavy drive with the bridge pickup keeping enough treble in the tone for good string separation, particularly when put through a bigger amp. The long-for-a-lap-steel scale length keeps the overall tone and response similar to a regular electric guitar - slightly less fat and chewy in the mids like older lap steels can be. The high action, solid bridge and complete absence of frets enable the strings to really sing out, so there's natural resonance and sustain in abundance, especially when partnered with a heavy steel. That sustain makes for highly emotive, spine-tingling single-note runs with a ton of reverb, a bit of drive and huge volume: Peter Stroud-tastic. If you want a darker tonality, the neck pickup does a great job. Flutey, fat and chunky it's a wonderfully evocative noise, conjuring Ben Harper in aces. The mixed setting enables you to do some cool crunchy strummy things, moving notes in chords for a unique texture in your recordings. Played loud and clean, you can really make the most of the bending levers. We had a lot of fun in open D major with the second string set to bend up a tone (to a D6 chord), and the third string up a semitone (making a Dsus4 chord). You can sound either celestial or seasick depending on your abilities. With the smaller housing, there's enough twang from the bridge pickup to sound Nashville-esque if you want it, and enough warmth at the neck to do mean blues. It's surprisingly versatile and very full sounding all over. Dieter Goelsdorf has a knack for delivering funky retro looks alongside dependable functionality and world-class tones. Adding palm benders to a lap steel creates a highly compelling instrument in the Pomona 6, one that anyone with an interest in bendy slidey things would be completely mad to ignore. The full scale length and excellent pickups make it a highly versatile instrument and, just as importantly, those benders work effortlessly with impressive tuning stability. This is extremely cool and utterly addictive.